​A lot of people love to shoot soft targets in their backyard for fun. Then there are folks who're serious about pursuing a career in rifle sports and hunting. Some people even think about joining the military. All these people have one thing in common - shooting. Among these individuals, a majority of them fail to realize their dreams. On the flip side, certain individuals move forward in the shooting arena like a breeze. ​The M40A5 is a replica of a standard rifle used by the United States marine. It's fully licensed and comes with features that are present in the real rifle. The M40A5 has a full-metal barrel assembly, and this includes bolt, trigger, flash hider, and barrel. Its body is crafted from a lightweight, but durable polymer. To facilitate easy installation of optics, the weapon has a standard Picatinny rail on its top. 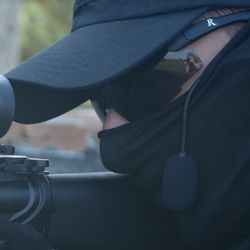 The stock design along with an adjustable cheek rest makes it easy for you to sight and acquire the target with the blink of an eye. With an impressive shooting velocity of 443 FPS, the gun allows you to take your shots effortlessly. If you're seriously looking for a sophisticated elite sniper rifle, then the M40A5 is an ideal choice. The package comes complete with a full metal barrel assembly, bipod adapter, fully licensed trademarks, engraved markings on the barrel, and full metal bolt. Other additions are a steel flash hider, tapered barrel, adjustable hop-up, and a metal magazine with 15 rounds. ​Buil​d - The built and body of the M40A5 are the key features of the weapon. Made to last longer, the M40A5 is a durable, adorable rifle in the affordable price range. These are some of the important reasons why many shooting enthusiasts prefer this rifle over others. ​Grip - The M40A5 features a textured body. This, in turn, ensures a slip-free grip. Even amateur shooters are able to get the right grip and shoot effortlessly with a little bit of practice. ​Safety - Injuries are common when you're just getting started with shooting. However, certain injuries can be long-lasting. You need a rifle that will let you shoot without injuring you. The M40A5 includes added safety features. Consequently, you can be sure that you won't incur injuries when taking shots in the field. ​Quality - When it relates to shooting weapons, quality is paramount. You can't gain proficiency in shooting with a poor-quality rifle. The manufacturers of the M40A5 understand this important point, and have sustained quality in all respects. Comfort - When exploring airsoft rifles, you should make certain that the weapon fits comfortably in your hands. Without comfort and convenience, shooting would be difficult. The M40A5 outplays others on this point. It renders the much-needed comfort and allows you to shoot effectively. ​Longevity - When you're looking for an airsoft rifle, it's important that you assess the durability of the weapon. If the weapon is fragile, you won't be able to use it longer. Consequently, you'll need to replace the rifle, which could hamper your practice. A durable weapon such as the McMillan M40A5 will stand the testing of usage as well as weather conditions and let you shoot uninterruptedly on the field. ​Usage - Using any air soft weapon requires a bit of practice. However, the rifle in question should be easy to use. No one wants to expend a lot of time on getting handy with the usage of the rifle. The good news is the McMillan M40A5 is pretty easy to use. Even an amateur enthusiast can get used to with this weapon within a few hours time. ​Upkeep - Regular upkeep is imperative to enjoy the companionship of your weapon for a long time. However, certain air soft guns and rifles require too much attention and expenses on maintenance. As well as eating your time, you'll finish up draining your wallet on maintaining the weapon. It's best to look for a rifle that needs little maintenance. This is where the McMillan M40A5 comes in handy. With minimum expenses and little upkeep, you can lengthen the life span of this high-applauded weapon. ​Good Warranty - One of the biggest pros of this innovative sniper rifle is the 30-day warranty period. Although the 30-day warranty may seem too small, the warranty covers almost anything. You can have the product serviced and repaired within this period. Also, you can return the rifle in case you aren't happy with your purchase. ​Warranty - As the rifle is well-made, there's no need for any sort of warranty. In spite of this, the weapon is backed by a 30-day warranty. During this period, you can call the vendor for fixing any repairs. In case the item arrives at your place in a bad condition due to shipping issues, you could have it replaced. Above all, you can get a refund within this 30-day window if you aren't happy with the weapon quality. Affordability - While experienced shooters have no problem buying a costly air soft rifle, amateurs may not be willing to invest too much. As a starter, anyone would like to try an affordable weapon. The McMillan M40A5 lives up to the expectations of amateurs as well as experienced shooters in this respect. While the rifle comes with a small price tag, it matches the shooting needs of experienced shooters as well. ​Since the rifle is a replica of an original weapon, some users face difficulty with its usage in the beginning. This is more so with respect to the varied additions of the rifle. However, you could overcome that issue with a little bit of practice. Once you get handy with the rifle, using it'll be a breeze. ​Targeting soft or hard objects with airsoft weapons isn't a big problem. However, effective shooting warrants time and sincere efforts. While anyone can try his luck in the shooting arena, only successful shooters book their ticket in shooting. If you wish to be a successful shooter, start practicing with a top-class airsoft rifle such as the McMillan M40A5 Gas-Powered Airsoft Sniper Rifle. With such a handy rifle by your side, there's no reason why you won't accomplish your shooting goals.